The result: The best pressure relief in the genital area, unrestricted freedom of movement in technically challenging terrain and pure cycling comfort without typical seat problems. Women who love all-mountain, enduro or long cross-country rides, are finally getting a saddle tailor-made for them in the SM Women: equally sporty and comfortable in the moderately inclined posture that is typical of MTB. This is exactly what the Ergon pros as well as our amateur test riders wanted and it is exactly what the development team implemented. Definitive factors for this are the redesigned opening in the genital area, sporty comfort padding, a short saddle nose, a flattened tail and the V-shape for maximum pubic bone support. For effective relief and protection of soft tissue area. Extra comfort delivered by large Gel Inlays in the sitting and soft tissue area (Sport Gel Variants). Saddle shape adapted to the anatomy of the female pelvis – effective relief of the female genital area. Men are from Mars, Women are from Venus. The title of this best-seller book could also apply to the bike, as the women from the Ergon development team know all too well. Not only do they work on innovative and ergonomic bicycle products, but they also live the sport and experience the same common discomfort complaints of women riders… especially in the genital region. Numbness and pressure pain using conventional unisex saddles reduced the desire to mountain bike even among our women experts. One thing was clear for our women developers: There finally needs to be a truly women-specific MTB saddle. Conversations with women colleagues and friends confirmed their experience and so the project was born. 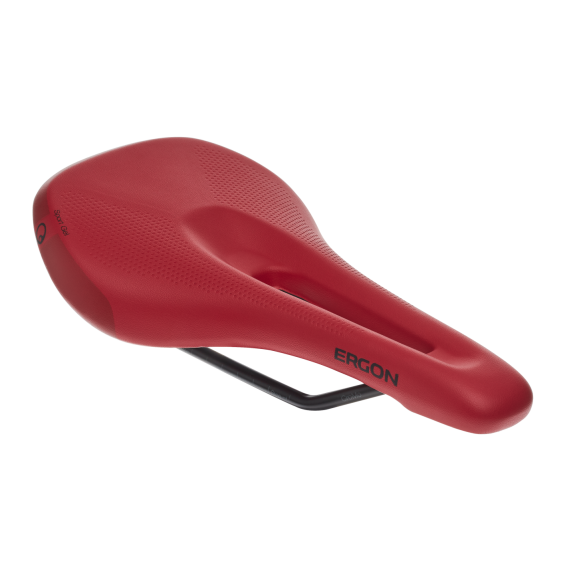 Surveys of female Ergon factory riders and other amateur cyclists clearly defined the main problem zone: Most complaints on the bike are due to the pressure in the front of the genital area. We tackled the details with this knowledge. As part of a University thesis, the individual pelvic characteristics of women and men were examined in a study and the images of many MRI images and computed tomography scans were evaluated. Result: Women have a wider pelvic bone arch than men. The distance between the pelvic bone and the saddle is therefore much shorter. In addition to this anatomical difference, women have much greater pelvic flexion. Consequence: When cycling, the pelvis tilts forward significantly further, increasing the pressure on the pelvic bone. Our designers create countless designs and sketches until the final form is ready. After the saddle form comes out of the CNC milling machine, the contours are checked with the profile template. Our designers Tine Juckwer (left) and Isabell Jusek fine tuning a prototype. Series of pressure measurements in the Ergon saddle laboratory confirm the operating principle of the SM Women saddles. 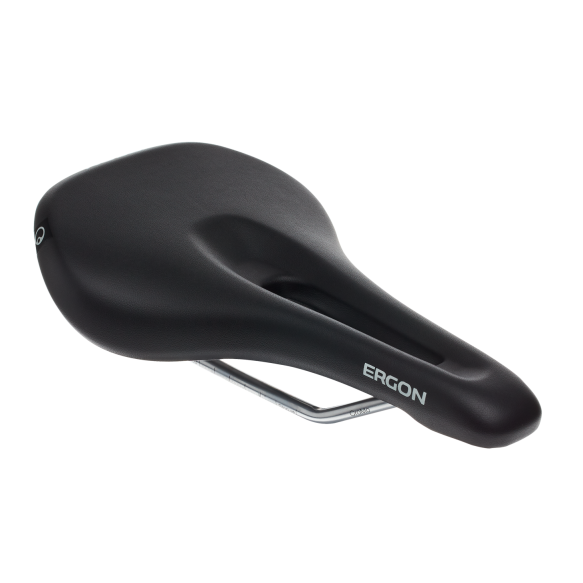 Based on these findings, saddle prototypes were created in the Ergon research department and were continuously tested and improved by employees and pro riders. Their feedback guided us step-by-step to the final SM Women. The large, forward-set relief channel immediately stands out to the eye. This provides noticeable pressure relief for sensitive areas. The saddles nose is designed to be wider on the SM Women in order to optimally distribute the pressure around and forward of the large relief channel. But how do we achieve the best possible saddle for the rapidly changing body positions of all-mountain riders at speed? Since MTB riders generally sit upright on their saddle, we have designed the ramp at the end of the saddle to be flatter. In addition, the radius of the leg cut-out is designed so that the SM Women always has enough seating surface for a dynamic position. And while standing and peddling, the saddle offers the space you need with the necessary support and control. The SM Women is padded in two different versions. The “SM Sport Gel Women” has large gel pads in the seat and genital area and is the “extra comfort version” for cross country, all-mountain and enduro. The “SM Women” with comfort padding (without gel inserts) offers maximum relief in the sensitive genital area of female riders. Friction-reduced side flanks allow quick changes of position without having the feeling of sticking to the saddle. The 29-year-old Californian beamed as she receives her personal SM Women saddle at the Ergon headquarters in Koblenz. Ergon sports scientist Antonio Blago prepares the pressure measurement in order to adjust the saddle perfectly for professional mountain bikers. After the bike fitting it’s time to ride the forested singletrack of Koblenz: Ergonomist Janina Haas (front) shows the former US Junior Champion our most beautiful trails. Where is there a more beautiful place to talk shop than while enjoying a view of the Mosel? Janina (front) and Rachel enjoy the break during their test ride in Koblenz.